In large bowl stir together Potatoes, eggs, flour, green onion, pepper, salt, and baking powder. Heat 1 tablespoon oil in a 12-inch nonstick skillet over medium heat. 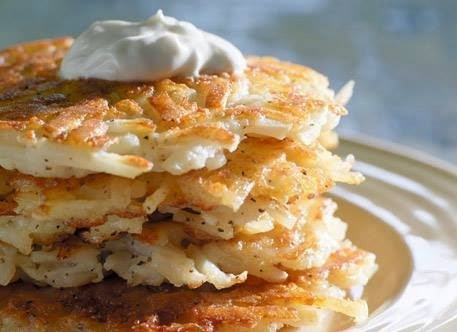 Cook 4 latkes at a time: spread 1/4 cup potato mixture for each latke into 3 1/2-inch circles in skillet. Cook 4 to 5 minutes, turning once. Repeat with remaining potato mixture and add oil to skillet as needed. Season with salt and pepper if desired.